LeBron James is returning to the team he spent his first seven seasons with, the Cleveland Cavaliers. 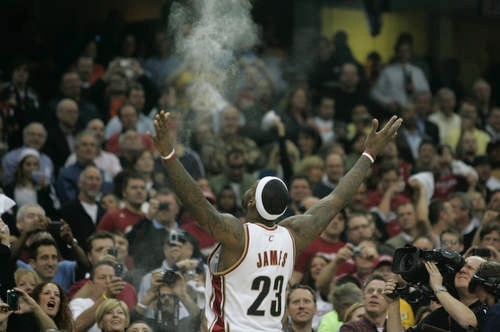 Where were you when you heard the big news about LeBron James going back to Cleveland? I got the news on Friday when I was done showering at home. I checked my phone and the update from the KCRA app read that LeBron James would be returning to his hometown team that drafted him and spent his first seven NBA seasons with, the Cleveland Cavaliers. I later read his essay from SI.com that explained why he was doing it. I couldn’t help but smile and admire the reasons why he was coming back. Four years ago when James made his “decision” to join the Miami Heat, it wasn’t the decision to join them that bothered me, but the way he did it. Then the scissor step party made me want to puke. Then Dan Gilbert’s letter of sour grapes was released. It made me not want to root for James and it made me hate the idea of an NBA superteam of players who all want to team up instead of compete against one another. Basketball was made less enjoyable. James’ essay changed that. James made it clear why he is coming back. He wants the people of Northeast Ohio to experience what Miami has, a championship, something that has eluded this region for half a century. The city’s last championship win was the 1964 NFL Championship, where the Browns beat the Baltimore Colts 27-0. Since then, many Cleveland teams have tried to get back to a championship and have come up short. The Browns in the 1980s getting upended by the Denver Broncos in the AFC Championship Game. The Cavaliers in the 1980s not being able to get past Michael Jordan and the Bulls and then in 2007 losing to the Spurs in the Finals. Then you had the Indians in 1995 and 1997 falling short in the World Series. You also had the Browns leaving for Baltimore in 1995 and then James’ notorious departure four years ago. Cleveland sports fans have not been able to catch a break. James wants to help change the culture in Cleveland of a city that just can’t win into one that can and will. He has some great pieces in place to do that with Kyrie Irving,who just recently re-signed to a five year, $90 million deal. You have talented players in Tristan Thompson and this year’s top pick Andrew Wiggins. Also,Kevin Love may be on his way as well if the Cavaliers and Timberwolves can work out a proper deal. Love is said to be “intrigued” by a deal and would be willing to sign long-term with the Cavaliers. This certainly has the makings of something special. As James said, this will take some time and his patience will be tested, but how cool would it be if he delivers a championship to Cleveland?